For a limited time, get your signed copy of The GUSTO POWER™ Workbook when purchased here. Having a natural curiosity for many things, and the talent to fulfill each idea, is truly a gift: to yourself, your organization, and your community. The trick is knowing how to navigate productively between your diverse set of passions. 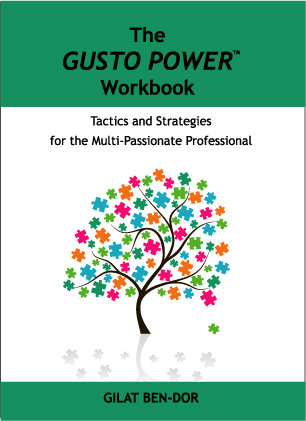 The GUSTO POWER™ Workbook is an extension of the GUSTO POWER™ leadership development and coaching program created by Gilat Ben-Dor, specifically for multi-talented, multi-passionate professionals who seek clarity without sacrificing their sphere of passions. The exercises in this workbook work well with individuals as well as group and work team situations. Signed Edition.